Let’s face it, not everyone has perfect toenails. There are millions of people in the United States who suffer from fungal infections on their toenails; anyone can get it. 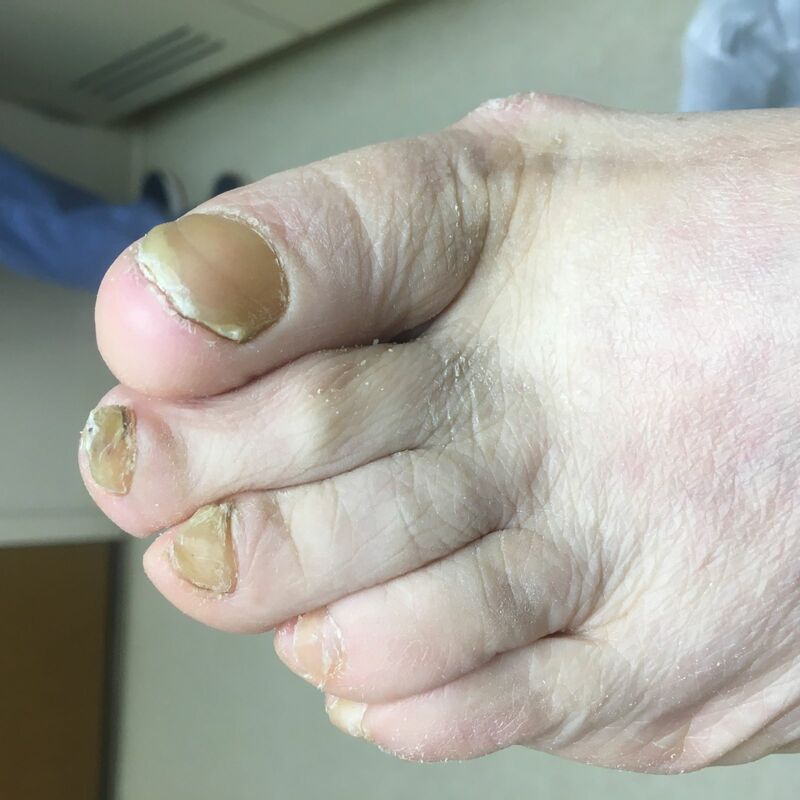 Onychomycosis also known as tinea unguium or just “tinea” is a disease of the nail that can cause a physical abnormality featuring the discoloring, hardening, cracking, and an overall brittle deterioration of the nail plate. While tinea is very common, most nail infections are more than just an isolated fungus. When we investigate an infection of the nail at Healthmark, we understand that the cause can be viral, bacterial, yeast, or some other foreign ailment afflicting the area in focus. Tinea can be caused in multiple ways so long as the introduced organism can take hold and grow as an infection. The infection is often picked up by having skin-to-skin contact to a surface harboring the microscopic pathogen. Walking barefoot on warm, moist surfaces, wearing old footwear, and using the same pair of shoes can increase the chances of acquiring an infection (or worsening an existing one). Anyone can acquire a fungal infection of the toenail. People coexisting with diabetes, poor circulation and nerve problems of the lower extremity may be more prone to tinea and additional ailments. Psoriasis, prolonged athlete’s foot and a lowered immune system (immunocompromised patients) can generate symptoms of toenail fungus. Walking barefoot in public areas. Older people and overweight individuals. Discoloration - the nail will become yellow, brown, green, white, black or tan; this might start out in a small spot and could spread to the entire nail surface. Toenail infections can be VERY difficult to heal and/or treat since there is often the presence of multiple organisms. Lack of or delay in treatment can help strengthen a well-established infection thus making it more difficult to manage. At Healthmark we will often implement multiple treatments to help facilitate the condition of the nail and toe.